It takes a bit of effort to get to the Beara Peninsula. Which is why not everyone who visits Ireland travels this far. Which is also why those that do either stumble across this breathtaking corner of Ireland by accident or come to this hidden gem of the world for very specific reasons. Take a look at a map and you'll see why the journey isn't exactly a simple one. Coming from Dublin? Then it's a five hour journey by car: three hours on the new M8 Motorway to Cork City, then take the N22 to the N71 turn-off, travel overland to Kilkeal; then down to the picturesque village of Glengarriff where Maureen O'Hara lived until recently (her departure is a story in itself and filled with local intrigue and gossip), then along the coast road into the interior of Beara to Castletownbere and finally to Eyeries Village (a lovely spot that I now call home). Traveling from Limerick and Shannon Airport isn't quite as bad but it's still a bit of a stretch for most people. As I've written elsewhere: unlike the Dingle Peninsula, the Ring of Kerry, or other spots, Beara Peninsula isn't exactly on the tourist trail. Why, then, do people come? Let me answer it this way: a few years ago, when I moved here, an Irish fellow banged on the front door. He had cycled from Cork City down to Eyeries and was desperate to find a place to pitch his tent. In that we didn't have such facilities in the village at the time, he asked me if I'd mind if he camped in my back garden. I had no problem with the idea and let him at it. Long and short of it is I now allow anybody who comes along with the appropriate gear to camp in the back yard. I've had folks from all over the world visit me: couples from Oakland California, a family of four from the Isle of Man, oldsters and youngsters from England, Scotland, Wales, France, Germany, Holland, and all places in between, and even a group of Scouts from Switzerland. It was hard work for them to get from where they had come from to the isolated microcosm called Eyeries, but come they did. Most come here to walk or bike along the scenic coastline. Some come to find ancestors. A few are interested in local history and archaeology. But others come for something else. They come to Beara because of the energy of healing to be found here. I'm not getting any younger and I've finally learned that human beings are a fragile lot. Into every life a little rain will fall - sometimes in torrents. We can be challenged by many complaints, sometimes of our own making and sometimes not. We suffer: from physical and emotional illness; from life's hardships including the death of loved ones, divorce and disaster. No matter how old we are, or how apparently strong and resilient, we can become scared silly by things that go bump in the night. And sometimes, we cannot cope. But if we're lucky, if the stars are aligned just right and if that Big Fella is looking in the right direction and notices our plight, we might be sent to Beara to find our way and gain a little sanity. At least that's what has happened to a number of people that I've met, me included. How, you might ask, does the Beara Peninsula heal? I would argue in many ways, and with many often unapparent tools. It works like this: healing, I think, comes in part from a sense of inner-peace - a sense of calm that allows us crazy humans to take stock, find a bit of safety, and get on with the healing process. The Beara offers that in spades. For instance: a few years ago I met a woman from the States who had gone through a disastrous, rancorous divorce. She was in absolute bits: her sense of self-worth was zero, just like her bank account. Her self-belief and self-respect had been stripped from her. The word 'hope' had been driven from her vocabulary and disaster defined her sense of tomorrow. For two weeks she stopped in Beara and did nothing else but to give herself permission to rest and emotionally heal. She took long walks along the coast in wind, rain, and sun. She borrowed a fishing rod and fished for mackerel and pollack off the nearby rocks - something she had never done before. She swam in the cold waters of Coulagh Bay and had a couple of pints with the locals. And she went home knowing that she could cope with what would come. Or take the couple from England. They had been through it all: a parent had died; they had been hit by the recession and had lost their home. One of them had contracted a chronic illness. In short, life looked dismal indeed. While visiting, they heard of a woman named Mary Maddison, a wonderful human being who has many gifts. While here, they visited Mary a few times. I know that Mary read their stones (which is not as weird as it may sound), allowed them to talk of their grief, sorrow, and worry, and gave them a healing session. Frankly, I'm a bit uncertain about the credibility of such healers. Many - not including Mary I hasten to add - are rip-off artists. They leverage people's frantic hopes with a snake charmer's promise and large fees to match. But Mary, who believes that her gifts were freely given and should be passed on just as freely, charges not one red cent. I'm not certain if the couple's wishes came true, but I do know that when they left Beara they left much happier and more content than when they first came. Or take Charlie and his wife Joanne. 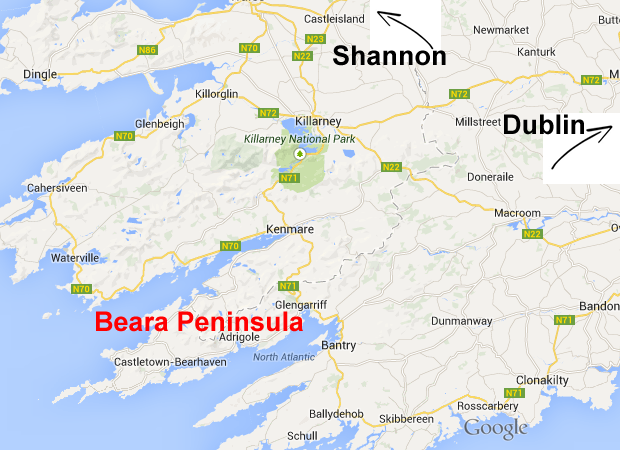 They are from the Boston area and having heard about Beara had always wanted to visit. Joanne, a visual artist and poet, had first come on her own for a stint at Anam Cara, the local writer's retreat center. She then convinced Charlie to come along and they began to rent a local house for two, three, and four months at a stint. I met them when I first moved down here and had the pleasure of spending Thanksgiving with them. They fell in love with the area and came back frequently. And Charlie decided to die here. It was unexpected, of course. They had come over with the intention of staying a few months. Charlie was working on a book; Joanne was painting. Scheduled to return to Boston he began to feel unwell. The flight was canceled and the local doctor called. Charlie, then in his early eighties, passed away with Joanne and close friends that he had made during his visits here at his side. As Joanne says, Charlie chose to die in Beara because he felt so peaceful that it was easier for him to let go. Dying isn't healing, of course. But Charlie found a depth of tranquility in Beara that Joanne believes he could find no where else. And that peace allowed him to slip from his mortal coil without pain or suffering. When I pass the house I always say hello to Charlie, firmly believing that he looks down on me as I trudge up the main road to the pub. Healing in Beara offers people other tools that may be more appropriate to their needs or beliefs. I've seen visitors talk to the local Catholic Priest in hushed confidence, or attending Mass for the first time, finding a faith here that helps them to walk forward through the difficulties of life. I've seen others visit the Buddhist Retreat (Dzoghzen Beara) to find peace and compassion in meditation. Still others, mostly women, locate renewed strength and peace of mind by visiting the Hag of Beara, a weirdly-shaped rock that looks down on the Bay not far from Eyeries. It is said that the rock is the frozen persona of St Brigid, or more likely, the Celtic Goddess also called Brigid who is the embodiment of the feminine, and a source of strength and renewal. Whatever people find or use, I watch them walk out of my sight renewed and refreshed. There is, it seems, a magic to be found in Beara. At night, when I'm on my own and standing on the deck that overlooks the Bay, I can sometimes feel it too. It is in the gentleness of the salt-smelling breeze that tickles my scalp, or in the call of the seagulls coming home from a day's fishing. It is in the voice of the tides that sweep over the rocks nearby and in the fingers of the sun's rays as they sink salmon colored over the Western horizon. The magic of healing is in the sing-song of the West Cork accents that greet me as a friend and neighbor, and in the scallops that have been given to me as a gift by a local trawler captain who I now call 'friend' and which I eat for dinner. As a friend of mine said, a woman from America who stayed here for weeks and who struggled with cancer, and who came here to find peace and acceptance: "I can't touch it or explain it. But there's a healing to be found here in Beara that goes beyond reason."